Map distortion is best understood looking at Tissot's indicatrix. 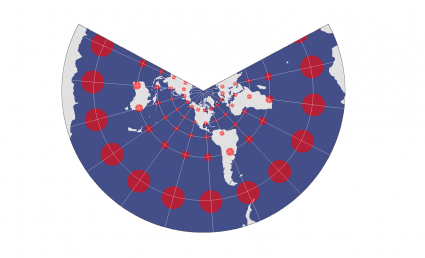 It contains circles and shows how map projections distort shape, size and distances. There really is no one best map projection. 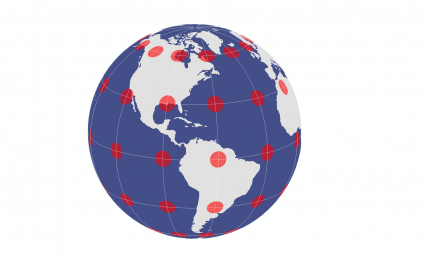 Each map projection distorts shape, distance, direction, scale or area and cannot preserve all map properties at the same time. 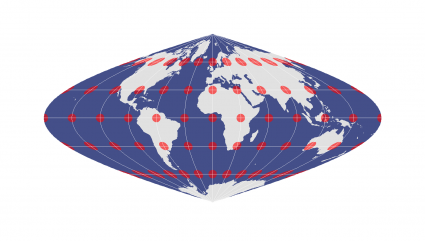 If you really want to know if a map has a conformal, equidistant or equal-area projection, Tissot’s indicatrix can help by showing the magnitude of angular, linear and area distortion. Let’s examine map distortion using Tissot’s indicatrix. The one true king of representing our Earth is a three-dimensional globe. This is because our globe is the only true surface where directions, distances, shapes and areas are true. On a reference globe, the Tissot indicatrices are conformal, equidistant and equal area. While conformal and equal area map projections are ‘major properties’, equidistant and azimuthal map projections are ‘minor properties’. Minor properties are local in specific regions and may be true for only selected lines. Conformal map projections preserve local angles and shapes. Often, meridians and parallels intersect at right angles. A map projection cannot preserve angles and shapes at the same time. When a map projection preserves angles such as the Mercator projection, the Tissot indicatrix are all circles but different sizes. For example, the Lambert Conformal Conic projection maintains local angular and shape relationships through out the map. But conic projection aren’t well-suited for mapping extremely large areas. However, the size of circles vary throughout the map projection, meaning it’s not equal-area and relative size is not preserved. At two given areas in a map, an equal area projection retains the relative size of areas. In an equal area projection, Tissot circles are all the same relative size across the map. Despite how indicatrices change from a circle to an ellipse, an equal area projection retains relative size. An equal area projection cannot also be conformal, as their shapes changes as shown in the sinusoidal projection. In other words, if the projection preserves area, then it distorts shape (and vice versa). The equidistant projection (or plate carree if the standard parallel is the equator) has a minor map property that maintains distance (or scale) along a set of lines in the map projection. Simply, it produces grids of equal rectangles. In the case of the equidistant cylindrical projection, distances along the equator and meridians are true distances and only along these sets of lines. Scale and distance have the same proportional length as that of a globe along specific lines with the equidistant property. However, a line that follows a parallel in the polar region is not the same distance as the equator. A compromise projection minimizes distortion in shape, area and orientation. However, a compromise projection is neither a conformal projection nor an equal area projection. For example, the Robinson projection uses a pseudocylinder to flatten a three-dimensional globe. Even though both shape and area distortion are low, its map properties remain distorted. No matter how hard you try, every single map projection distorts reality. Whichever map property you want to preserve, you can apply a conformal, equidistant or equal-area projections. Alternatively, if you want the best of all worlds (with still a bit of distortion), use a compromise projection. The best way to represent the Earth is with a globe. 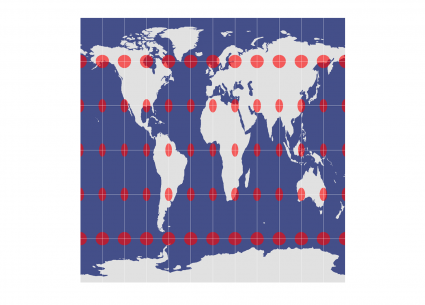 But map projections can be awfully useful too. 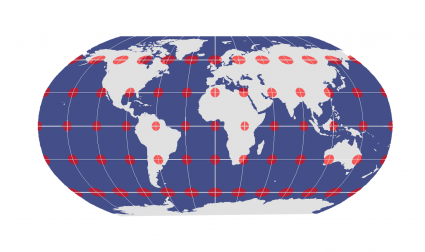 Find out why cartographers use map projections in GIS.